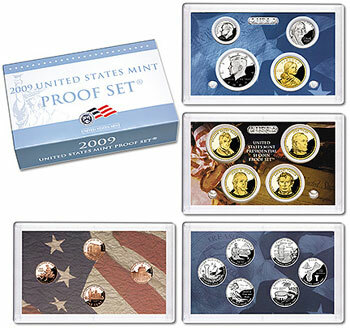 The 2009 United States Proof Set was released by the US Mint on June 1, 2009. The sets were priced at $29.95 and included a total of 18 different proof coins. This is the largest number of coins included in the standard proof set since they first started being offered. The large number of coins is the result of the inclusion of six different District of Columbia & U.S. Territories Quarters, four different 2009 Presidential Dollars, and four different 2009 Lincoln Cents. Due to the expanded number of coins in the annual proof set, the number of plastic lenses which contain the coins has been increased to four. One lens contains the quarters, one contains the 2009 Lincoln Cents, one contains the Presidential Dollars, and the final lens contains the remaining four coins. All coins are minted at the San Francisco Mint and have the “S” mint mark. The coins are specially minted with deep cameo proof finishes. The raised elements of the coins are frosted, while the background elements are mirrored. One special aspect of the 2009 Proof Set is the 2009 Lincoln Cent’s composition. The coins are struck in 95% copper composition which was used on the first Lincoln Cents produced in 1909. The 2009 Lincoln Cents struck for circulation are produced with a primarily zinc based composition. Separately, the United States Mint issued a 2009 District of Columbia Quarters Proof Set, and 2009 Presidential Dollar Proof Set. These sets are priced at $14.95 each. Later in the year, the US Mint will issue the 2009 Silver Proof Set, which contains 90% silver coins.